Have you always loved birding but have never had the time to do it right? Are you planning on a camping trip where you can enjoy birding with your family? Well, if you’re a beginner to birding, here are some useful tips you should consider. • Always keep an eye on the bird rather than flipping through your guide to identify it. You should look at the bird to identify the markings, song, feeding habits, movements and size then jot these things down in your diary. • Keep your ear out for bird songs and calls since they are the best way to identify birds. You can always listen while you’re looking directly at the bird to make the right identification. • Estimate the general shape and size of the bird to help you identify the correct family where it belongs. You should estimate the size of the bird in relation to other well-known ones for easier identification. • Take a good look at the facial markings and characteristics such as strips, patches of color, eye lines, eye arcs and much more. You should also take note of any markings on the bill since different birds have varying bill characteristics. • Next, you should identify the details on the tail, wings and overall body. You should identify these characteristics when the bird is in flight or stationary. • Look at the length and color of the bird’s legs and how they affect the movement and flight. Depending on the length and type of feet, the bird should have a different way of jumping from every branch, swooping up or down and flying in open air. • Identify the feeding habits such as foraging across the camping site, clinging to the bark of a tree and much more. Now you can record your observations about the bird including the region and climate where you identified it. That way, when you’re looking at the bird guide later, you can easily identify it. We hope you enjoy wonderful bird watching experiences as you camp and RV in Virginia. 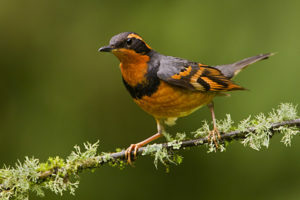 You’ll find our most common types of birds to look for at www.whatbird.com.